After her successful cover of the Mayonnaise hit “Paraan,” Sharlene San Pedro is going full throttle in the music scene with a debut album. The actress, who recently turned 18, in an exclusive interview with Push shared that Mayonnaise’s lead vocalist Monty Macalino will be producing her album. According to her, the decision to create an album began after her song won the Favorite Remake award in the recently-concluded MYX Music Awards 2017. The MYX VJ says they are still recording tracks for the album. “Nagre-recording palang kami para sa track four. So four pa,” she shared. The initial idea was to release the album on her 18th birthday April 5. But due to unforeseen circumstances they had to release it at a later date. 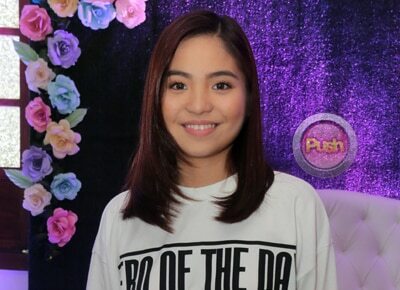 Since she’s well aware that her market contains those of the same age as hers, Sharlene assured that the album would tackle experiences of the youth. “Tsaka iniba-iba niya ‘yung genre kasi sabi ko gusto ko laidback lang, easy listening lang. Hindi siya parang masakit sa tenga. ‘Yung parang gusto mo lang pakinggan kapag nagse-senti ka,” she said.